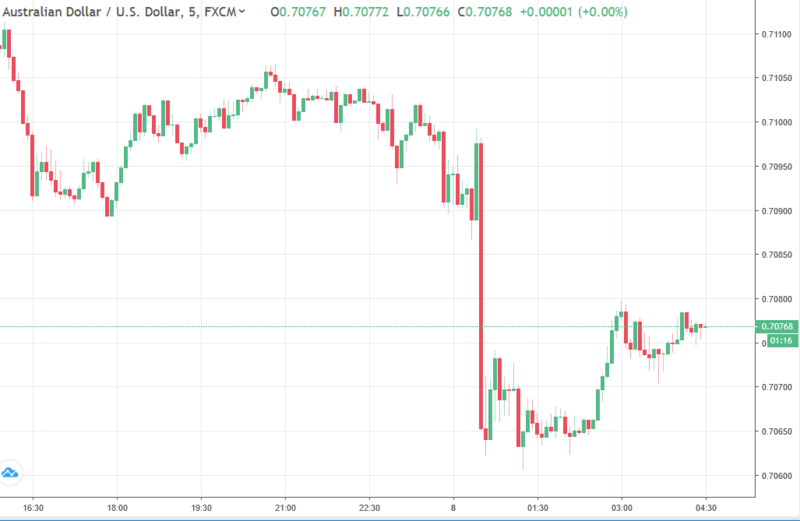 The drop in the Australian dollar, from just under 0.7100 to lows just above 0.7060 came on the release of the RBA's quarterly Statement on Monetary policy today. The bank took some hefty cuts out of economic growth forecasts and also were a little more circumspect on labour markets and inflation. This follows Governor Lowe's swinging the bank to a neutral bias earlier in the week, from its oft-reiterated tightening bias prior. The projections today suggest the Bank could probably swing to an easing bias without too much more of a nudge, but given how long it took them to pronounce on being neutral its likely best not to hold your breath. NZD/USD is net higher on the session. It fell alongside the AUD earlier, not to the same extent, but has since recovered and posted gains toward 0.6755. Even as NZ 10 year bond yields fell to their lowest ever, circa 2.08%. CAD lost a little more ground against the USD but without swinging in a large range. EUR, CHF, yen, GBP have all traded with not much gusto against the dollar since US markets shut up shop for the Thursday. A heads up, Chinese markets reopen on Monday. Trade issues will be front and centre with the past few days bringing less encouraging headlines (and more today on Huawei, see bullets above).